Don't miss to learn how to play to the game first! You are playing to a newer version (v1.6.0). Check the release notes to discover the new features! Share koloro.io with the WORLD! Mix Red, Green & Blue tiles to get White. Merge White tiles together to get a BIGGER tile. Mix Cyan, Magenta & Yellow tiles to get Black. Merge Black tiles together to get a BIGGER tile. Mix Red, Yellow & Blue tiles to get Black. Do the HIGHEST score & get the BIGGEST tile! First, you can display this tutorial or watch the video trailer below to have a quick preview of the game. You must mix together the 3 primary colors (red, green & bluecyan, magenta & yellowred, yellow & blue) in order to get a « numbered » tile (whiteblack) with weight 1. Once you get 2 numbered tiles side by side, you can also merge them together in order to get a bigger numbered tile (with a bigger weight, addition of the two merges ones), save some space on the game grid, and then get a new random primary color to mix. The final goal is to reach the highest score and get the biggest numbered tile! Mixing & merging tiles give you some points. Some bonus points are also added when you achieve special moves (like consecutively merging numbered tiles or achieve a « snake merge »). > See the LEGEND screen for more informations about scoring. You can only mix or merge tiles that are side by side, in one of the 4 directions (top, right, bottom & left / no diagonals). 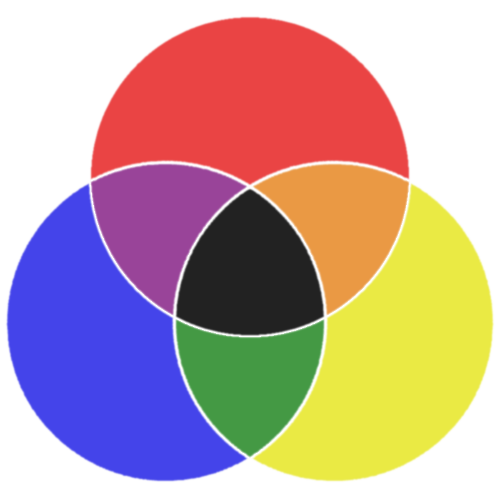 Of course you can only mix or merge tiles that are compatible with each other: 2 primary colors, 1 primary color with its complementary, 2 numbered tiles. To mix or merge tiles, just click/tap on a tile (source) and slide it to another compatible tile (target). Then release it, and it will merge with the target tile. If you bring a source tile above an incompatible target tile, nothing happens and the source tile will come back to its initial position. When you START A NEW GAME, you can choose several options to customize the game mechanisms. You can also choose to play with 3 different sizes of game grid : 4 x 4, 5 x 4 or 5 x 5. You can access to several GAME STATISTICS by clicking on the scores at the top of the game grid. You can then display the current screen (statistics of the current game playing), or the history one (statistics of previous games achieved, for each combination of difficulty levels & grid sizes). At any time, you can CONFIGURE SOME SETTINGS, to customize the game appearance: this is just a matter of taste!! Choose to display the whole game with the LIGHT theme based on light gray & blue (great for the daylight), or the DARK one based on dark gray & orange (better for the night). Choose the shape of the tiles on the game grid: SQUARE, ROUNDED or ROUND. 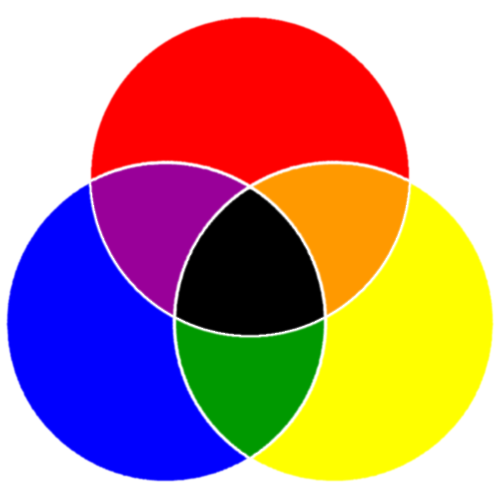 Display the colors with their ORIGINAL values, as defined in the color models, or choose to make them SMOOTHER to have less agressive colors and save your vision. My name is Antoine, and at this moment in 2019, I'm a 37 years old (ouch!) french guy, married, father of 2 children & owner of 2 cats. I'm working as a web developer, and I like that. So much that I also spent a part of my hobbies time to create websites and bring some of my obsessions ideas to life! For example, I created years ago the TooLiPHoNe.NeT website to provide some "webapps" (iEmpty, iCustom & iSkin) to customize an iOS device without jailbreak. Well, that's very interesting, but I guess that's all you wish to know about myself! I had the idea of creating this game some years ago, in 2014. This was the year when the 2048 game by Gabriele Cirulli conquered the world! So I started thinking about a 2048 derivative, like there were dozens created after it. 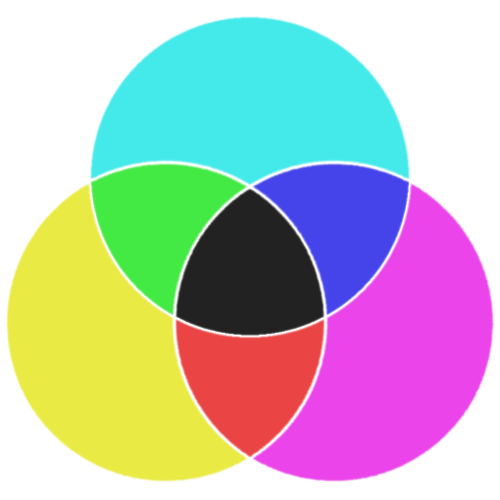 And I ended with a slightly different game concept in my mind: « What about mixing some colors instead of merging numbers ? ». 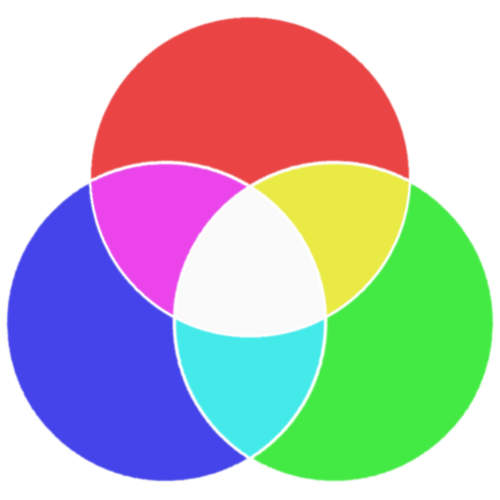 There are 3 primary colors to mix, and I thought there were something nice to do with it: The idea for my game was born, with all the basic principles in my mind! I kept the grid layout with tiles, and the principle of merging them together. But the game mechanisms are new and very different than a 2048-clone at the end! In all cases, a big thank to Gabriele Cirulli for inspiring me with its 2048 game creation! This moment came in early 2018 (January), when I had more time and some motivation to start a new web project. So I started making it during my free time. The game basis was coded in a few dozen hours (but it was ugly, just a « proof of concept »). Many more dozens were needed to have a « polished final product » ! The public beta version was released on June 8th 2018. The final version was released on July 20th 2018. Finding the name was not the easiest thing... but one of the more exciting! This is a moment I like before starting a new development project: find a name first, then a domain URL to host it and craft a logo before starting to create something from an idea. This gives me the motivation I need to go to the end! I was looking for a short and "strong" name that everybody can understand and remember easily. And also a free domain name that latch with it of course! That's why I focused on the .io domain extension: I think it has a certain "cool factor", it is already used by some online games (like the famous agar.io game), and there are more available domain names than with a .com or a .net. Finally, I saw that Google Translate can translate in Esperanto : What a better language to be "universal"?!? The translation of the « color » word gave me the « koloro » result: BINGO! I like that!! This is strong and simple, and very "graphical" with the "o" letter every 2 letters : koloro.io. I hope you'll like to PLAY WITH IT! If yes, please don't forget to SHARE IT! First, mix all 3 primary colors together to get a numbered tile with weight 1. New colors will randomly "pop" on the game grid. Then, merge the numbered tiles together to get a bigger tile and save some space on the game grid for new colors. You can get great bonus points by achieving consecutive or "snake" merges! The game ends when you can't achieve any additional move. Your goal is to reach the highest score and get the biggest numbered tile. You can play it in easy level (with some hints to help you) or in normal one. You can also change the grid size for different game experiences! At any time, you can customize the game appearance, like the color model to use, the tiles shape, or activate the "dark" mode. For babies. With move hints & undo ! The classic one. Without any helpers. 16 tiles. 4 rows. 4 columns. 20 tiles. 5 rows. 4 columns. 25 tiles. 5 rows. 5 columns. Share your game with the WORLD! 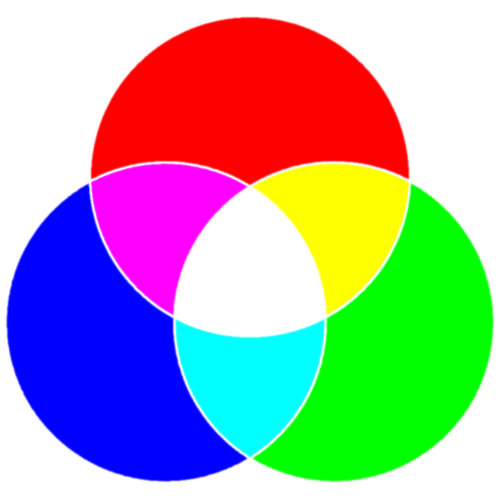 Mix two primary colors together to get a secondary color. Mix a primary color with its complementary secondary color to get the whiteblack numbered tile (weight 1). Merge two numbered tiles together to get a new numbered tile with a bigger weight and save space on the game grid. It is better to merge the biggest tile into the smallest one to get more points! Achieve some special moves to get extra bonus points! Merge several numbered tiles together CONSECUTIVELY. The order of the merged tiles is not important. Merge numbered tiles together in order to achieve a "snake" (the source tile of a merge is the target tile of the previous merge). This is a variant of the CONSECUTIVE merge where the merge order is important. Do the LONGEST snake to get more points, as the longest snake length achieved during the combo session will be a MULTIPLIER of the consecutive merge bonus points! Thanks for sharing koloro with the world! Just want to say « hello » or give me a feedback? You'll find here th history of all released versions, and the features I plan to develop next. It seems that Local Storage in not supported or enabled by your browser! The koloro.io game needs Local Storage to work properly. Please enable it in your browser settings (and avoid private mode).